It is a follow-up to the incredibly popular SR1 model. This upgrade offers you a range of new and improved features, as well as more flexible design – including a less rigid purge cover – which ensures a more comfortable underwater experience. 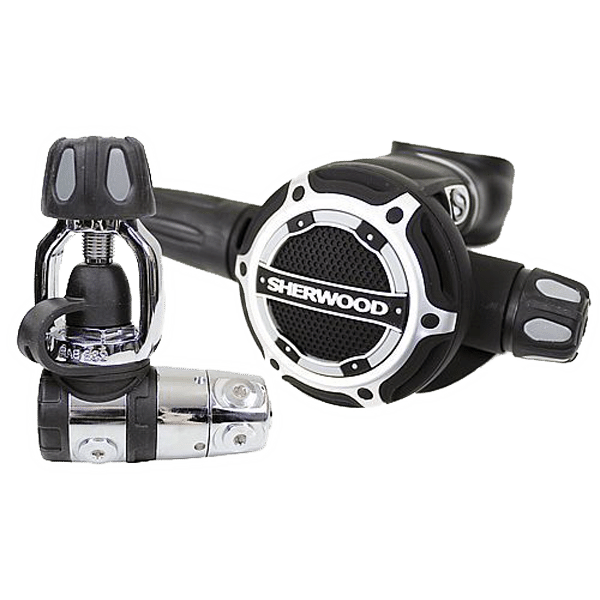 The Sherwood SR2 Regulator offers highly responsive breathing performance with advanced technology in a surprisingly compact package. It makes a great regulator if you’re just starting out diving, but versatile enough for more advanced diving situations. Who Is Sherwood SR2 Designed For? In the video below you can get a closer look at the Sherwood SR2 regulator and some of its main features. The SR2 utilizes a 2 piece balance piston first Stage to deliver to deliverer optimum intermediate pressure to the Pneumatically balanced second stage. Resulting in a sharp responsive breathing performance at a wide range to cylinder pressure and depths. To help make things quick and simple, the ability to adjust performance with single-touch technology is certainly something that helps to make this a particularly appealing piece of kit. Being able to find the optimal balance with the minimum of effort takes the stress out of using the contraption, allowing you to concentrate on a relaxing dive. It has to be said, the super flex hose really helps to make it easier to attain a comfortable and natural position in the water. The novel SMART Demand Lever helps to prolong the life of the seat, mainly by responding to depressurization, which reduces the load that would otherwise be on the seat. Sherwood also designed the SR2 First stage with a sealed dry spring chamber which prevents water and contaminants like silt and sand from entering the regulator. This helps increase performance over time while at the same time giving added protection in cold water diving. Well designed regulator. Lightweight second stage but the 1st stage is on the heavier end. Excellent Breathing Performance due to balance designed. Single adjustment point makes tuning breathing resistance simple. Strong and sturdy construction.SMART demand lever and floating crown maintains performance between servicing. If you don’t mind spending a little extra then you’ll be happy with the quality and performance. Overall, you get good value for your money with the SR2. The SR2 delivers excellent breathing performance comparable to those of other high-end regulators like the Scubapro Mk25 S600 and the Atomic T3. The single adjustment point simplifies diving. Simply turn the dial to min on the surface to control free flow and max to get the best breathing performance under water. The swiveling torrent also provides multiple hose routing options as well as also reduces jaw fatigue by helping to release tension in the low-pressure hose. This also allows you to mount the regulator to the dive tank in any position. It’s surprisingly lightweight second stage will also help with jaw fatigue and its compact design makes for easy packing and storage. There is little not to like about this regular, It has everything a recreational diver would ever want. It breaths great has customization setting, is compactly designed and has a very light second stage. However, it heavier second stage may add to your overall weight when traveling and the mouthpiece may be a little too small for most people. Thanks to many of the regulator’s high-functioning capabilities this regulator is suited for a wide range of diving conditions. Much like the SR1 before it, this regulator works great even if you are a beginner diver just starting out or an experienced diver with 100 of dives under your belt. Given the price range thou, this is a regulator to consider if you’re serious about scuba diving. If you’re only planning on diving a couple time a year, then you should consider a less expensive model. Can this regulator be used for cold water diving? You’ll have no problems using this with temperatures as low as 10 degrees centigrade. How heavy is the SR2 Regulator? It weighs about 3.85 pounds (1.75kg ) but feels relatively weightless when you’re down there. Is The Sherwood SR2 also available in DIN? This is probably the ideal piece of kit for someone who has dabbled with diving to start with and is now getting serious about making it a recreational activity of choice; although, to be fair, the benefits of the SR2 make it ideal for the majority of diving enthusiasts – novice or pro. So, if you are looking for a sophisticated yet straightforward-to-use regulator that will make your diving experiences feel natural then what’s keeping you – invest in this marvelous product and you’re bound to be delighted with your purchase every time you go into the water. Do you have any experience with the Sherwood SR2, good or bad, please feel free to share in the comments below.